We not only love to dance, but we love to teach. Since 1985, Julie’s Dance Studio has been teaching the art of dance to both children and adults. Offering a fun and safe environment, our students practice teamwork while building lasting friendships, gaining self-confidence and true sense of accomplishment, developing healthy minds and bodies through dance exercise, improving motor skills and much more. At Julie’s Dance Studio, we teach life lessons through dance. Julie’s Dance Studio is the area’s leader in family-friendly, quality dance education for children and adults. We teach the best practices and offer a full curriculum of modern/ contemporary, jazz, ballet, pointe, tap, world dance, hip-hop, salsa, boys club, acro tumbling, adult fitness & fun and much more. Click the link below to learn more about our class formats and to view our class schedule. The Nutcracker Ballet…All Jazzed Up! 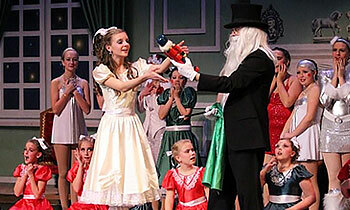 Julie’s Dance Studio’s dazzling production of The Nutcracker is the perfect way to celebrate the holiday with family. Click here to see show times and purchase tickets.